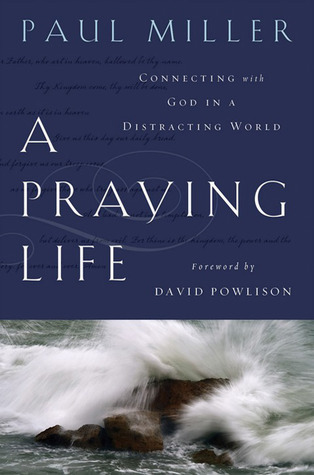 I just finished reading A Praying Life: Connecting With God In A Distracting World by Paul E. Miller and I can't even describe how radically it is revolutionizing my prayer life. Prayer has never come naturally to me - does it for anyone? - and, honestly, an entire book on prayer isn't the first thing I'd choose off the shelf. Spending time alone in prayer often feels forced, plastic, or like I'm just talking to myself. Instead of feeling my true need for fresh, daily communion with God, it feels more like a dry task on my to-do list. Recently, our family has been going through several stressful circumstances - some of which I'll mention here in coming days. Thankfully, our marriage and family have never been stronger. It's outside struggles that have been attacking from every side. It's felt somewhat like a desert. Basically, the opposite of thriving. And when Miller writes specifically about desert seasons that God allows in our lives, I read it as if it had been written for me. "The still, dry air of the desert brings the sense of helplessness that is so crucial to the spirit of prayer. You come face-to-face with your inability to live, to have joy, to do anything of lasting worth. Life is crushing you. Suffering burns away the false selves created by cynicism or pride or lust. You stop caring what people think of you. The desert is God's best hope for the creation of an authentic self. The desert becomes a window to the heart of God. He finally gets your attention because he's the only game in town. You cry out to God so long and so often that a channel begins to open up between you and God. When driving, you turn off the radio just to be with God. At night you drift in and out of prayer when you are sleeping. Without realizing it, you have learned to pray continuously. The clear, fresh water of God's presence that you discover in the desert becomes a well inside your own heart. Maybe this speaks to you, too. Maybe this book would be as soul-refreshing for you as it has been for me. Yes, it's a book devoted to prayer. But because prayer is simply our communication with God, it's truly about the heart of God toward his children - and there's nothing more encouraging than to grasp how much he loves us. I'm so glad. Miss you, Jess.